The Smithfield Recreation and Aquatics Center SRAC Sharks Swim Team started out the season with the motto “Practice Like A Champion” and finished the season undefeated as well as earning first place at the Southern Metro League Championship Swim Meet. The event was held Saturday at the Smithfield Recreation and Aquatics Center. The SRAC Sharks are led by Head Coach Shannon Walters, Elizabeth Ashley, John Fische/, Mikia Jacobs, Gracie Smith, and Peyton Whitaker. The SRAC Sharks consisted of 68 swimmers (girls and boys) ages ranging from 4 to 18 years of age. 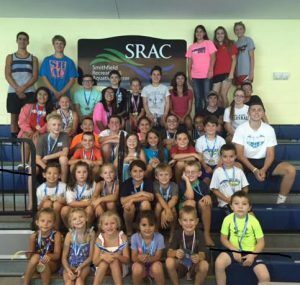 The SRAC Sharks swam for a total combine 537.50 points on Saturday, July 30. This championship is the first ever for the SRAC Sharks since being formed in 2009 with the building of the Smithfield Recreation and Aquatics Center. The SRAC Sharks put in a tremendous amount of work this season by practicing as much as 5 times a week and competing weekly with other league affiliated swim team. The SRAC Sharks swim team are part of the Southern Metro League which is made of swim teams from area pools located in Wake and Johnston counties. For more information on how to join this program or about the Smithfield Recreation and Aquatics Center contact Laura Crumpler, 919-934-1408 or by email.